For undergraduate courses in Algebra and Trigonometry with optional Graphing Calculator usage. The Eighth Edition of this dependable text retains its best features - accuracy, precision, depth, strong student support, and abundant exercises - while substantially updating content and pedagogy. After completing the book, students will be prepared to handle the algebra found in subsequent courses such as finite mathematics, business mathematics, and engineering calculus. 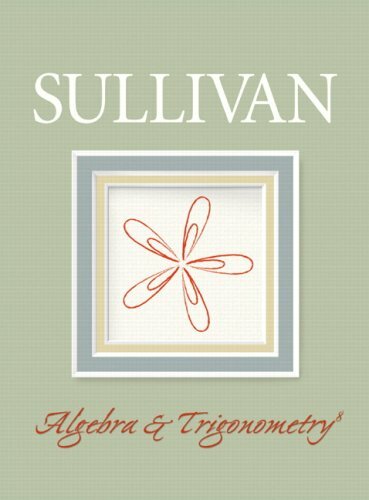 Mike Sullivan Professor of Mathematics at Chicago State University received a Ph.D. in mathematics from Illinois Institute of Technology. Mike has taught at Chicago State for over 35 years. He has been writing textbooks in mathematics for over 30 years. Mike has authored or co-authored over ten books. He is a native of Chicago's South Side and currently resides in Oaklawn. He has four children: Kathleen, who teaches college mathematics, Mike III, who co-authors many titles as well as teaches college mathematics, Dan, who is a Prentice Hall sales representative, and Colleen, who teaches middle-school mathematics. Nine grandchildren round out the family. Why I Wrote This Book: As a professor of mathematics at an urban public university for over 35 years, I understand the varied needs of precalculus students who range from having little mathematical background and a fear of mathematics courses to those who have had a strong mathematical education and are highly motivated. For some of your students, this will be their last course in mathematics, while others may decide to further their mathematical education. I have written this text for both groups. As the author of precalculus, engineering calculus, finite math and business calculus texts, and, as a teacher, I understand what students must know if they are to be focused and successful in upper level mathematics courses. However, as a father of four, I also understand the realities of college life. I have taken great pains to insure that this text contains solid, student-friendly examples and problems, as well as a clear writing style. I encourage you to share with me your experiences teaching from this text. The eighth edition of this series builds upon a solid foundation by integrating new features and techniques that further enhance student interest and involvement. The elements of the previous edition that have proved successful remain, while many changes, some obvious, others subtle, have been made. A huge benefit of authoring a successful series is the broad-based feedback upon which improvements and additions are ultimately based. Virtually every change to this edition is the result of thoughtful comments and suggestions made from colleagues and students who have used the previous edition. I am sincerely grateful for this feedback and have tried to make changes that improve the flow and usability of this text.